Time and gravity can lead to sagging skin on the face and neck. This can result in a much older appearance. Surgery used to be the only option for tightening skin. Fortunately, modern technology has allowed for other, non-invasive methods. Ultherapy is currently the most popular treatment in Northwest DC for tightening and lifting skin and getting rid of that turkey neck or recently coined, tech neck. Ultherapy provides a safe and effective way to lift the skin without surgery or downtime. It is the only non-invasive skin tightening treatment approved by the FDA for lifting the skin on the neck, chin and brow. Over time, the collagen in our skin diminishes. This can lead to sagging skin and wrinkles. 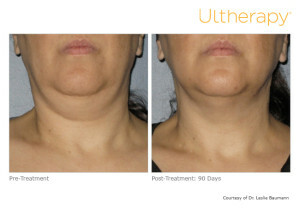 Ultherapy works by stimulating the body to produce more collagen. Since it takes time for the body to produce collagen, the results of Ultherapy improve over time. During Ultherapy, focused ultrasound is used to lift and tighten skin. The ultrasound energy is directed at layers of tissue deep within the skin. This encourages the body to produce more collagen. Over time, Ultherapy can be extremely effective. Results are typically seen within three to six months of treatment. Ultherapy treatment takes approximately one hour to complete and there is absolutely no downtime. Although some redness after the procedure is normal, most patients are able to return to their everyday lives immediately. The best candidates for Ultherapy are between the ages of 40 and 60 years of age with mild skin sagging. Individuals that do not want to undergo surgery and those that wish to have a touch-up to a prior surgery can also benefit from Ultherapy. The results of Ultherapy can vary based on the skill and experience of the professional performing the procedure. Chevy Chase Cosmetic Center has extensive experience performing Ultherapy as well as other cosmetic procedures. We specialize in safe, effective and non-invasive methods. We utilize the most advanced and up-to-date FDA-approved treatments to help our patients look and feel their best. Please contact us for more information about Ultherapy or to book a consultation with one of our board-certified dermatologists in DC.